THIS IS A BEAUTIFUL HANDKERCHIEF WITH LOTS OF DETAIL! 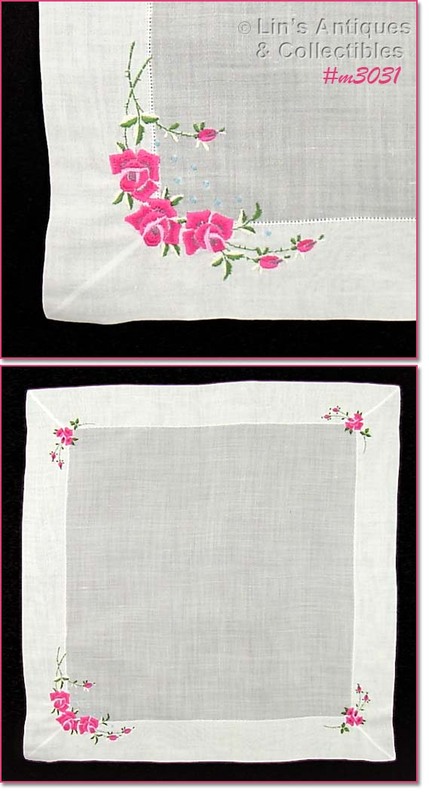 HANKY IS WHITE WITH EMBROIDERED PINK ROSES AND MEASURES 11 ¾” X 12”. GORGEOUS! AN UNUSUAL HANKY WITH A “MOD” DESIGN! HANDKERCHIEF MEASURES 12” X 12”. NEAT! ISN’T THIS A PRETTY HANKY? 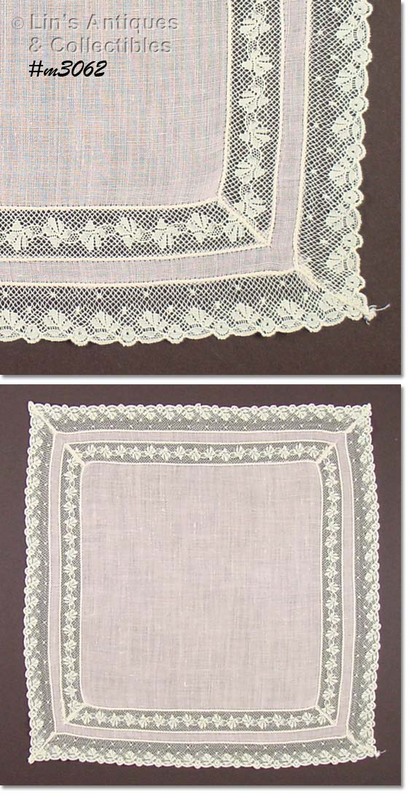 IT’S WHITE WITH EMBROIDERED PURPLE VIOLETS, MEASURES 11 ½” X 11 ½” AND HAS A LACEY BORDER/EDGING – VERY FEMININE. THIS HANKY IS OUTSTANDING – ADD TO A COLLECTION OR FRAME TO DISPLAY! THE DESIGN IS A FAN WITH GREEN ORCHIDS DISPLAYED ON A PRETTY PEACH COLOR BACKGROUND. HANDKERCHIEF MEASURES 12 ¼” X 12 ¼”. GORGEOUS! THIS IS A LOVELY HANKY! IT’S BLACK AND HAS A PETIT POINT BOUQUET IN ONE CORNER. HANKY MEASURES 12 ¼” X 13” AND IS IN EXCELLENT CONDITION. BLACK HANDKERCHIEFS ARE DIFFICULT TO FIND! THIS PALE PINK HANKY WOULD BE A PRETTY WEDDING HANKY! IT MEASURES 10 ¾” X 10 ¾” AND IS IN EXCELLENT CONDITION. PLEASE SEE PHOTO TO FULLY APPRECIATE THIS LOVELY HANDKERCHIEF. THIS IS ANOTHER BEAUTIFUL WHITE HANKY! 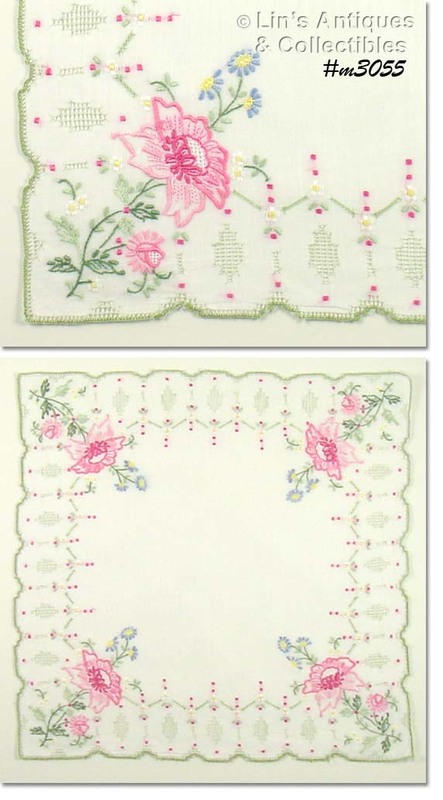 IT’S COLORFUL WITH PINK FLOWERS, BLUE FLOWERS, AND GREEN ACCENT STITCHING – WOULD BE A GREAT WEDDING HANDKERCHIEF TO ADD A SPLASH OF COLOR. HANKY MEASURES 11 ¾ x 11 ¾” AND IS IN EXCELLENT CONDITION. THIS HANDKERCHIEF IS EYE-CATCHING BECAUSE OF THE COLORS! 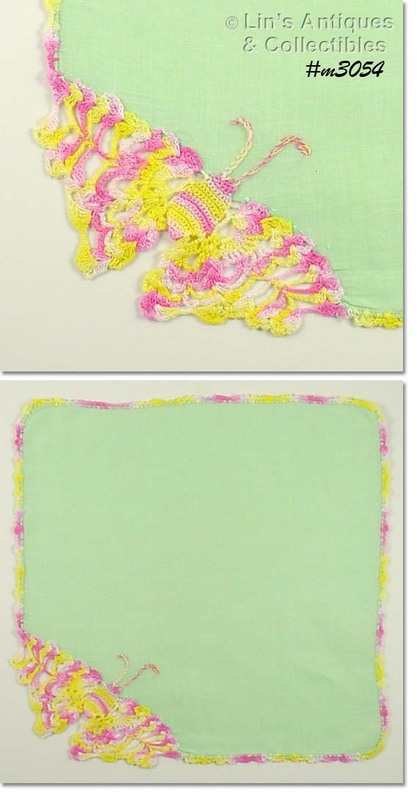 THE LINEN HANKY IS MINT GREEN COLOR AND THE CROCHET EDGE/BORDER AND CORNER BUTTERFLY ARE PRETTY PINK, YELLOW, AND WHITE COLORS. HANKY MEASURES 11 1/8” X 11 ¼” AND IS IN EXCELLENT CONDITION. THIS IS AN UNUSUAL HANKY! 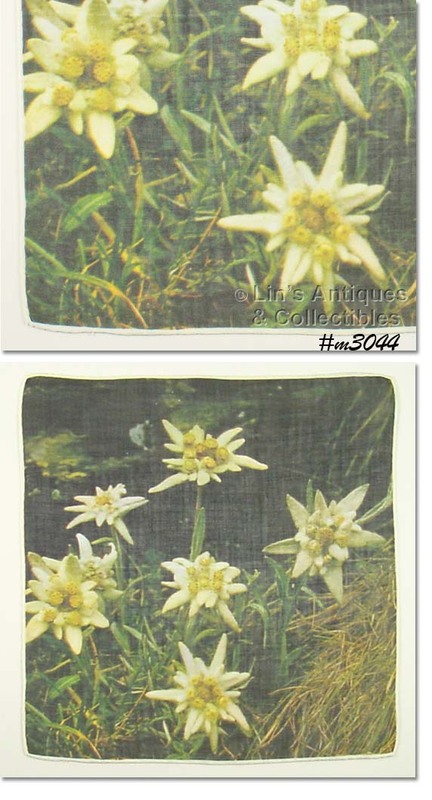 IT HAS VERY DETAILED WHITE FLOWERS ON A BLACK BACKGROUND. MEASURES 11” x 11 ½” AND IS IN EXCELLENT CONDITION! THIS HANKY IS BEAUTIFUL! IT’S WHITE WITH EMBROIDERED PINK ROSES IN EACH CORNER. MEASURES 13 ¼” X 13 ¼” AND IS IN EXCELLENT CONDITION. THESE TWO HANKIES ARE TOP QUALITY AND HAVE A RATHER UNUSUAL DESIGN OF COLORFUL BIRDS! HANKIES MEASURE 12" X 12 1/4", HAVE HAND ROLLED/STITCHED HEMS, AND ARE IN EXCELLENT CONDITION. THESE ARE NEAT HANDKERCHIEFS! BOTH ARE MARKED: "DESIGNED IN AUSTRALIA BY HEIL" AND BOTH HAVE BIRDS ON THEM. 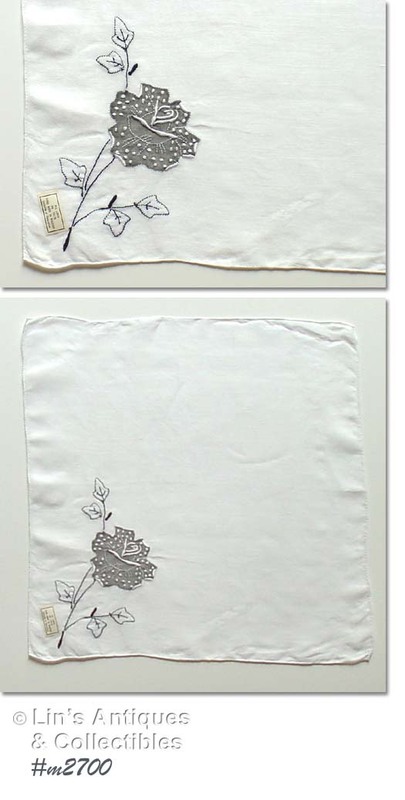 ONE HANKY IS TITLED "AUSTRALIAN BIRDS" AND THE OTHER IS "LORIKEETS". 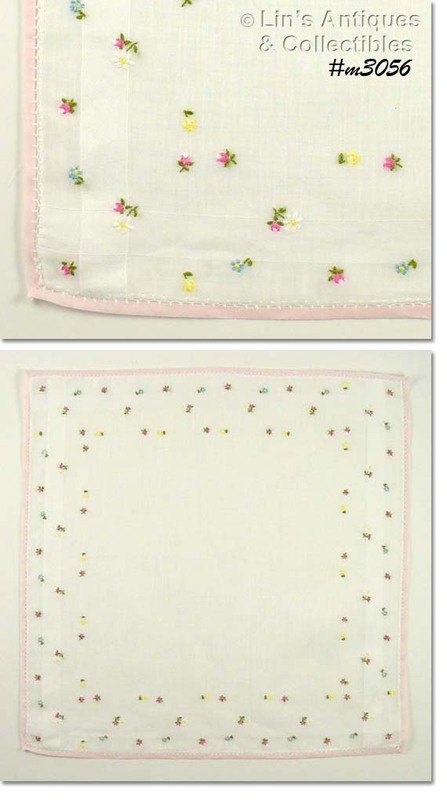 HANKIES MEASURE 11 3/4" X 11 3/4", HAVE MACHINE STITCHED HEMS, AND ARE IN EXCELLENT CONDITION! This hanky is so very colorful – it would be a lovely display piece or would make a striking throw pillow – the design is of a tropical fish! Hanky measures 11” x 11 ½” and is in excellent condition. 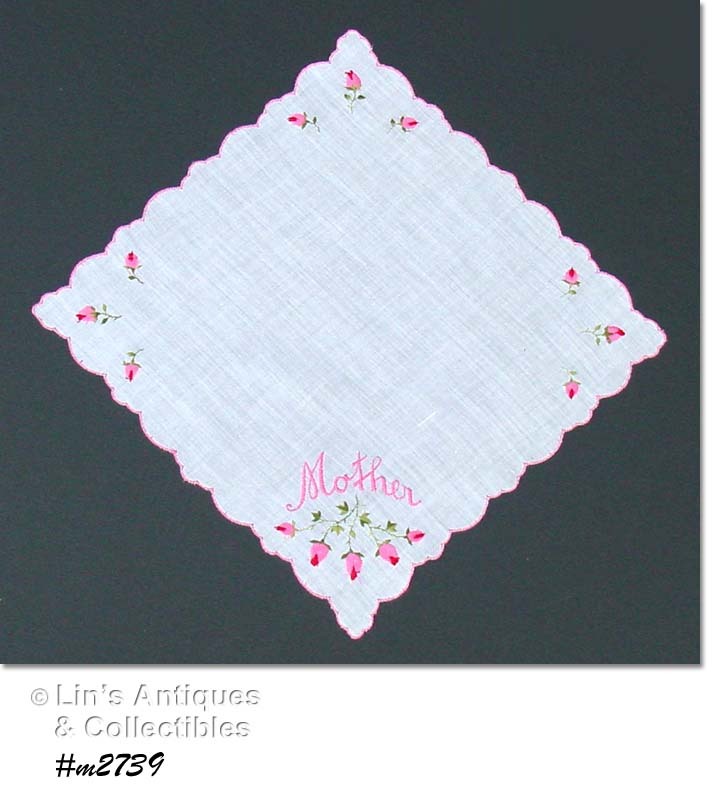 THIS IS A LOVELY HANDKERCHIEF – A PERFECT BIRTHDAY OR "JUST BECAUSE" GIFT FOR MOM! HANKY IS IN EXCELLENT CONDITION, LAUNDERED, LIGHTLY STARCHED AND IRONED – READY TO GIVE! 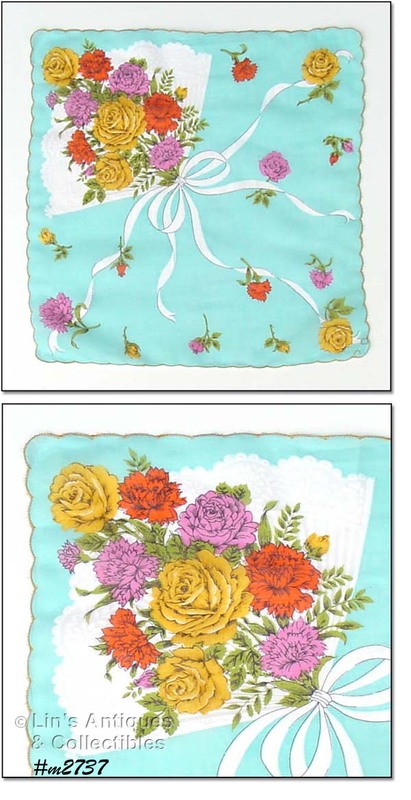 THESE TWO HANKIES FOR MOTHER ARE LOVELY AND WOULD BE WONDERFUL BIRTHDAY OR "JUST BECAUSE" GIFTS FOR MOM! 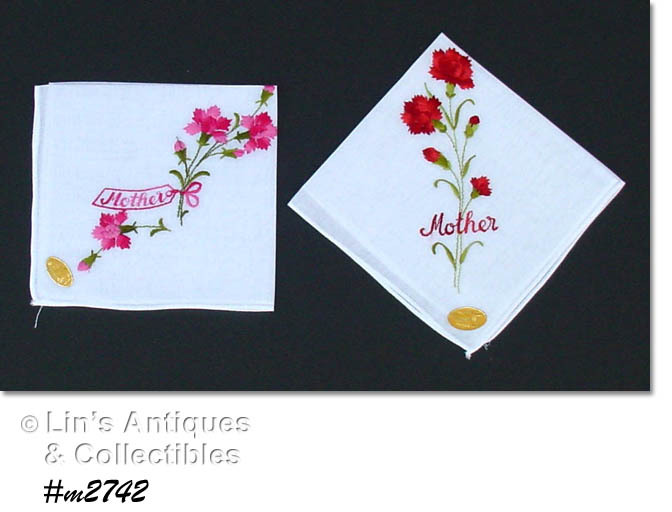 ONE HANDKERCHIEF HAS RUST COLOR CARNATIONS AND THE OTHER HAS PINK CARNATIONS, BOTH HAVE “MOTHER” EMBROIDERED ON THEM. HANKIES HAVE BEEN LAUNDERED, LIGHTLY STARCHED AND IRONED. THEY HAVE THE ORIGINAL STICKERS – I REMOVED THEM PRIOR TO WASHING AND REPLACED AFTER IRONING. 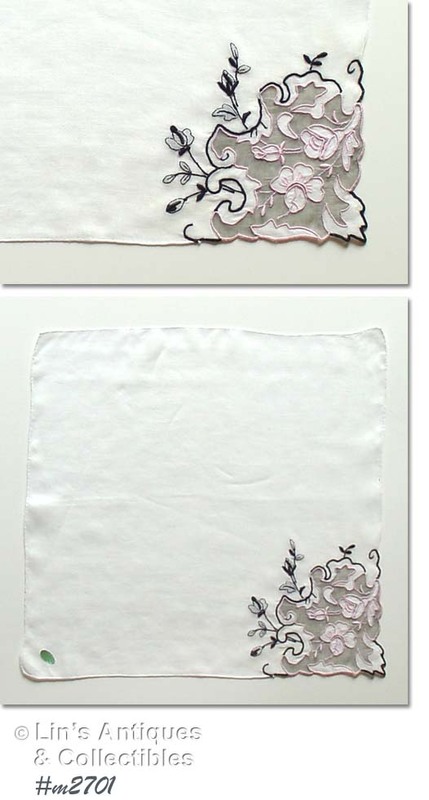 ISN’T THIS A LOVELY HANKY -- IT WOULD BE A WONDERFUL BIRTHDAY OR "JUST BECAUSE" GIFT FOR MOM! HANKY HAS BEEN LAUNDERED, LIGHTLY STARCHED AND IRONED. READY TO GIVE TO THAT SPECIAL MOM!! 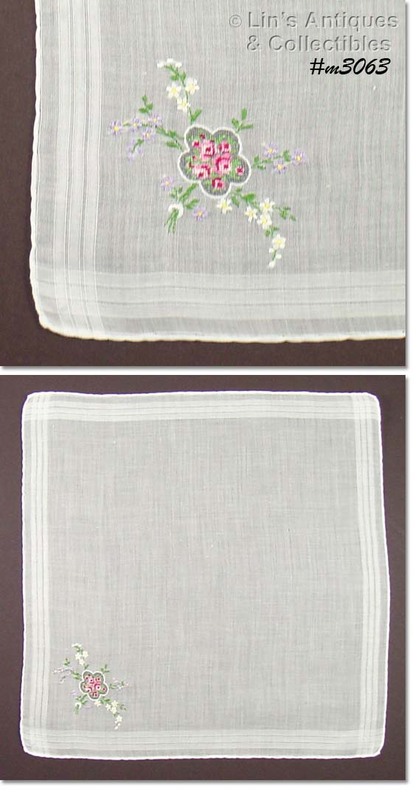 THIS IS A GORGEOUS HANKY TO ADD TO A COLLECTION, FRAME, OR DISPLAY! THE HANKY IS A PRETTY AQUA COLOR DECORATED WITH A WHITE FAN WITH RIBBON STREAMERS AND BOUQUET OF ROSES AND CARNATIONS. THERE ARE ADDITIONAL ROSES AND CARNATIONS SCATTERED AROUND THE HANKY. MEASURES 14 ¾” X 15” AND IS IN EXCELLENT CONDITION. HANKY HAS BEEN LAUNDERED, LIGHTLY STARCHED AND IRONED. THIS HANKY WOULD BE SO PRETTY FRAMED OR MADE INTO A THROW PILLOW! 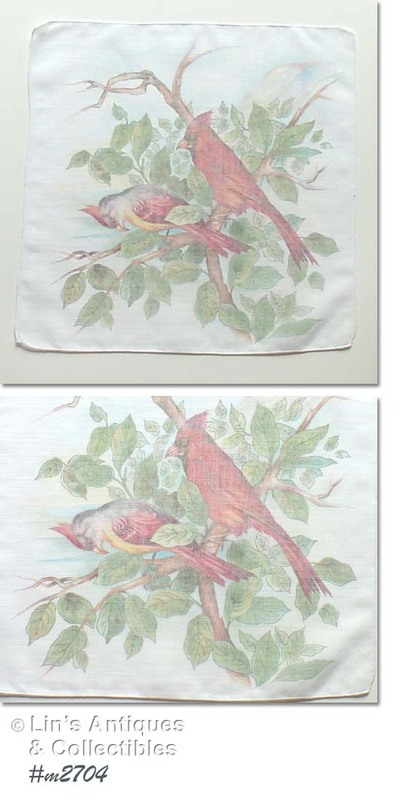 THE HANKY IS WHITE WITH A DESIGN OF A CARDINAL PAIR ON A TREE LIMB. THE ATTENTION TO DETAIL IS OUTSTANDING WITH SOFT, MUTED COLORS – IT IS NOT FADED. HANKY MEASURES 12 1/8” X 12 ¼” AND IS IN EXCELLENT CONDITION. 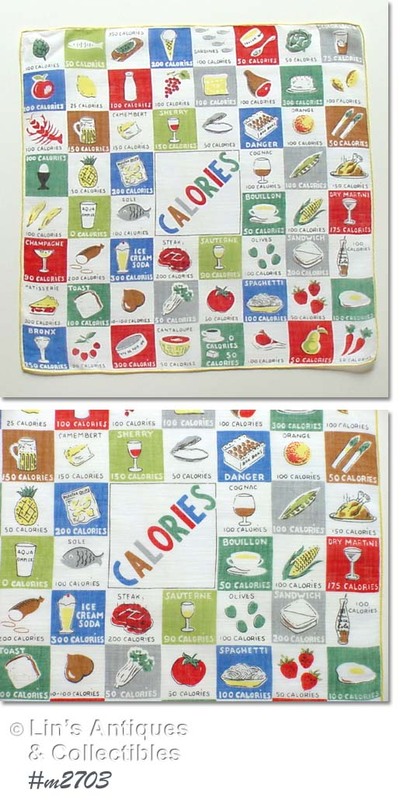 THIS CALORIES HANKY IS VERY COLORFUL AND HAS LOTS OF DETAIL! IT MEASURES 13 3/8” X 13 3/8” AND IS IN EXCELLENT CONDITION. THIS HANKY HAS OODLES OF DETAIL! THE FOCAL POINT IS A HORSE-DRAWN CARRIAGE THAT’S DRIVING AWAY WITH THE NEWLYWEDS AND THEIR LUGGAGE. SEATED ON THE LUGGAGE IS A CHERUB HOLDING THE BRIDE’S BOUQUET! THERE ARE MORE CHERUBS ON THE HANKY AND THERE’S A PRETTY FLORAL BORDER. HANKY MEASURES 11” X 11” AND IS IN EXCELLENT CONDITION. ANOTHER BEAUTIFUL MADEIRA HANDKERCHIEF! MEASURES 13” X 13” AND IS IN EXCELLENT CONDITION -- HAS THE ORIGINAL MADEIRA LABEL/STICKER. THIS IS A BEAUTIFUL MADEIRA HANDKERCHIEF! IT MEASURES 12” X 12” AND IS IN EXCELLENT CONDITION – STILL HAS THE ORIGINAL MADEIRA LABEL/STICKER.